Prefabricated wood I-joists are proprietary structural wood members that consist of fingerjoined solid sawn lumber or laminated veneer lumber (LVL) flanges attached to a plywood or oriented strand board (OSB) web using adhesive. 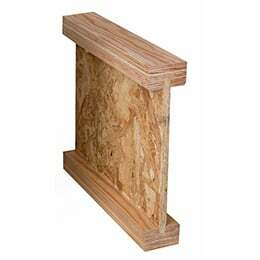 Web panel joints are glued and mated by several methods such as butting of square panel ends, scarfing of the panel ends, or shaping of either a toothed or tongue and groove type joint. Exterior rated, waterproof adhesives such as phenol-formaldehyde and phenol-resorcinol are the principally used for the web to web and web to flange joints. Different combinations of flange and web materials using alternative connections between the web and the flanges are available from several manufacturers (refer to Figure 3.20, below). Wood I-joists are available in a variety of standard depths and in lengths of up to 20 m (66 ft). Each manufacturer produces I-joists with unique strength and stiffness characteristics. To ensure that proprietary products have been manufactured under a quality assurance program supervised by an independent third-party certification organization, manufacturers typically have their products evaluated and registered under the requirements and guidelines of the Canadian Construction Material Centre (CCMC). The cross-sectional “I” shape of these structural wood products provides a higher strength to weight ratio than traditional solid sawn lumber. The uniform stiffness, strength, and light weight of these prefabricated elements allow for use in longer span joist and rafter applications for both residential and commercial construction. Wood I-joists are usually manufactured using untreated flange and web material and therefore, are typically not used for exterior applications. Wood I-joist are also dimensionally stable as they are manufactured with a moisture content between 6 and 12 %. For the installation of mechanical and electrical services, many manufacturers provide requirements and guidance for the shape, size and location of openings, notches, holes and cuts. Most wood I-joist suppliers also stock standard joist hangers and other prefabricated connection hardware specially designed for use with wood I-joists.